The dust has finally settled in the Black Rock Desert, both literally and otherwise. Black Rock City, the largest temporary urban encampment in the world was 45,000 strong this year and for the first time made a full official effort to go green. 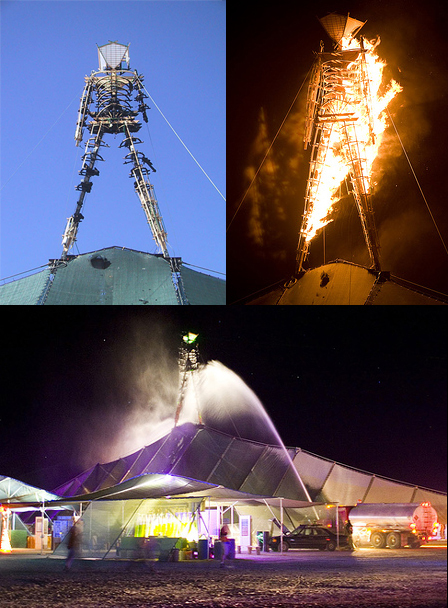 From the unfortunate hanging suicide of a participant to the surprising and subversive early burning of The Man, the festival was even more out of the ordinary this time around, as some of these images illustrate. Crude Awakening was the most talked about art piece related to the Green Man theme. 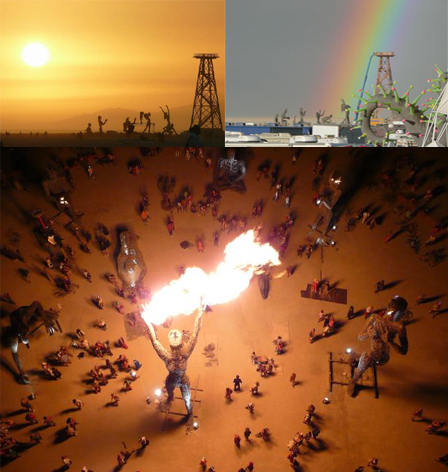 The above images, by Marc Merlins, show the breathtaking view-at-night from on top of the oil platform down on the fire-breathing sculpures below, as well as the sculptural set during the appearance of a strange series of rainbows across the Playa. 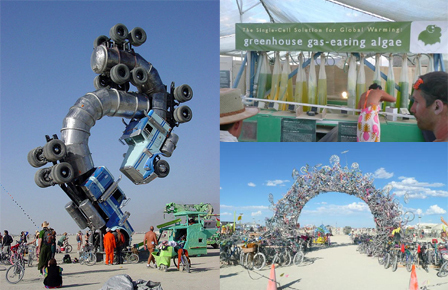 However, critics have suggested that Burning Man 2007 failed to go green, despite the organizers’ best intentions. Though the event has always been indirectly funded by corporate money (indirectly during the Dot Com boom) this year corporations were allowed to directly supply the event with materials and structures, which has also aggrevated some participants. It is easy, though, to either wax ecstatic or blindly criticize the festival without seeing it in its true shades of grey. 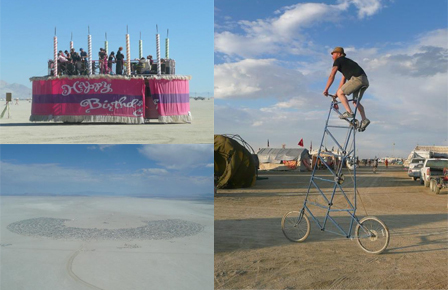 At the end of the day, pictures of Burning Man reveal it to be filled with creative and bold art and art cars alongside serious attempts at environmental sustainability. So long as it remains an ongoing social, cultural and environmental experiment, it will hopefully remain interesting and dynamic, evolving to test new boundaries and raise new questions.